Today (March 4th), our group is all over the place. 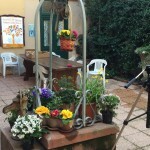 Some of us stayed in Bologna to film some B-Roll for our documentaries, some went to a reception center for refugees,“Villa Angeli” directed by Lai-Momo and the rest of us met Hayat, who we interviewed last week, at the train station to spend the day in Imola at an anti-violence shelter and intercultural women’s center, Trama di Terre. 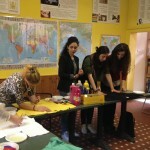 I (Ingrid) was in the latter group, along with Maddie, Nadia, Professor Rose and Professor Marini-Maio. I love the emphasis on “intercultural” after seeing so much separation between Italians and immigrants in the past few weeks. 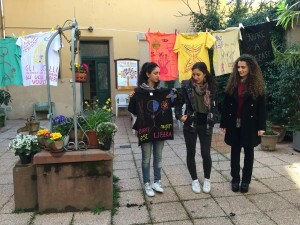 Hayat has been volunteering at Trama di Terre since she was 16! It is thanks to her that we were able to visit today and spend time learning about the association. 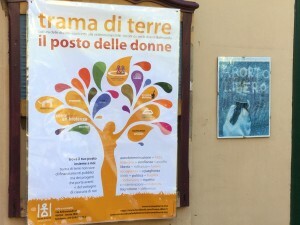 Fourteen women from five different nationalities founded, the now internationally renowned, Trama di Terre in 1997. 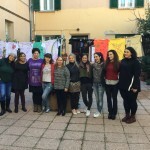 Loosely translated from their web page “chi siamo”, their guiding idea since starting the association has been to find a meeting and sharing point among women in the community from all different nations (including Italy), while being aware that often for migrant women the fight for access to material and symbolic resources places them a position of dual vulnerability. 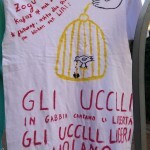 Without citizenship, migrant women have fewer legal rights and recognition from the government, but also from regular Italian citizens. 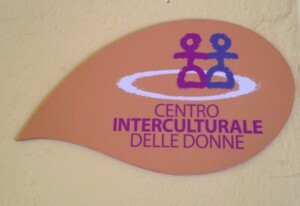 Not only is it a community and educational center, but it’s also an anti-violence center that provides refuge for women of all nationalities seeking to escape domestic violence. Staying true to this statement, when we arrived around 10:30am, there were women from various African countries, Eastern European countries and even some Italian high school girls who were volunteering that day. 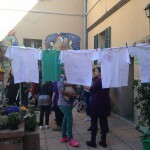 Our main goal of the visit was to share the Global Clothesline Project with the women there. 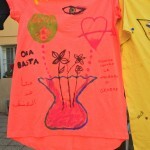 The project bears witness to violence against women and invites them to create t-shirts that express their experiences with violence and healing. Professor Rose gave a short talk about the project, including how it was founded, where she has done various projects and a viewing of the documentary trailer that featured women from various countries talking about the making and the meaning of their shirts. I spent a lot of that initial time just observing the women present in the room. As the whole project became clearer and clearer to each woman, I saw their eyes light up and smiles creep onto their faces, which made me all the more passionate about our mission today. 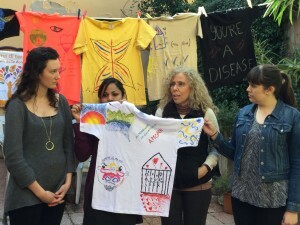 After hearing all about the project, the women were invited to create t-shirts that expressed their violence and healing. 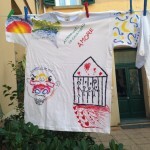 It’s harder than you’d imagine to find solid color t-shirts, puffy paint and feathers in Italy. I guess America really is the crafty capital of the world. We did manage to grab some shirts and markers, though. 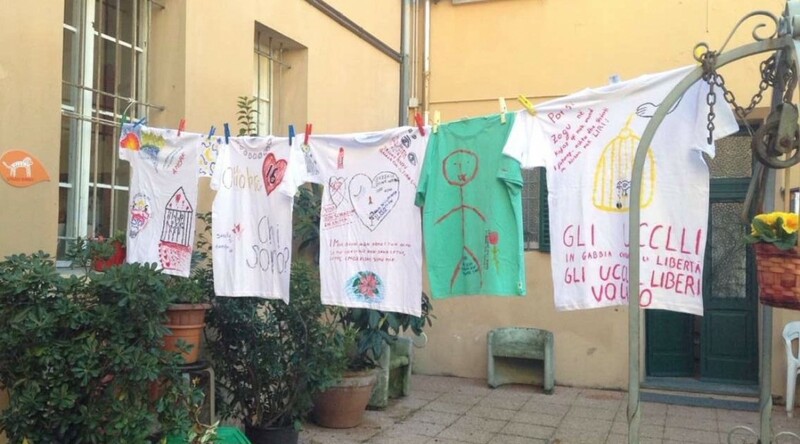 The color of the shirts is important, because each color represents a different form of abuse or whether the victim survived the experience. 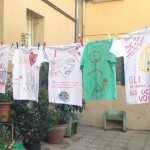 Going into a Clothesline Project, though, you never know how many of each shirt you’ll need, so you get what colors you can and then hope for the best. In the end, none of the women were upset when their color wasn’t available, they were just excited, or at odds, about how they would be decorating the shirts! Some did shirts on their own, while others shared a shirt. 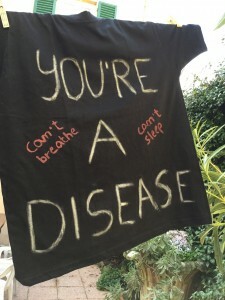 I made a shirt with Hayat, Maddie and Professor Marini-Maio. Since we were making a white shirt, which is for women who have died because of violence, I decided to do a sunrise and Starry Night-esque sunset. I wanted to represent the cycle of life, as well as the hope and community that is always there to see us through our dark times. 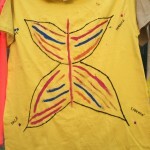 While my paintings were not so personal, most were, including all the other parts of the shirt I shared. 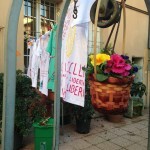 The wonderful thing about the Global Clothesline Project is that you can put whatever you want on the shirt, freedom some women may not experience elsewhere in their lives, and then your unique, intimate masterpiece gets to be displayed in public. 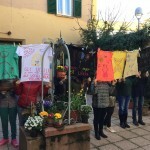 Women who are often silenced can “air their dirty laundry” without anyone knowing that it’s theirs or facing repercussions because of “speaking out”. To be free. To be creative. To know that you are sharing this emotional journey with others. To finally have a voice. To just walk away. 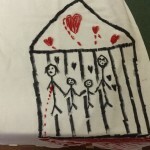 This project is empowering. 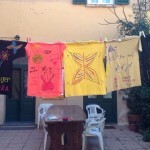 Once we had finished hanging the shirts, taking photos, sharing the meaning behind each one if we felt comfortable, together we all got to share a meal, handmade by women at the center. Everyone got a big bowl of homemade Moroccan couscous with vegetables and chicken, and after devouring that, we moved onto dessert: sweet mint tea and a traditional flatbread that reminded me of a combination of pita and crepes. Sounds weird, but it was oh so perfect. In my opinion, sharing a meal is a powerful experience. 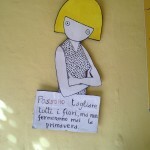 I felt that at Casa Don Gallo in Padova, and I felt it today. 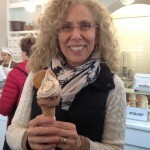 Everyone needs to eat, and the conversations, laughter and happiness that come from eating makes anyone smile. 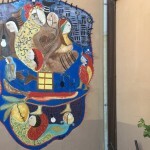 We left Trama di Terre this afternoon with full bellies, and full hearts. 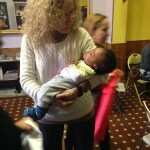 Prof. Marini-Maio with the cutest 5 month-old baby you ever did see.